Holy cow these are definitely keepers. Sound fantastic. Here's a pic of the M100 next to the M80 it is replacing. 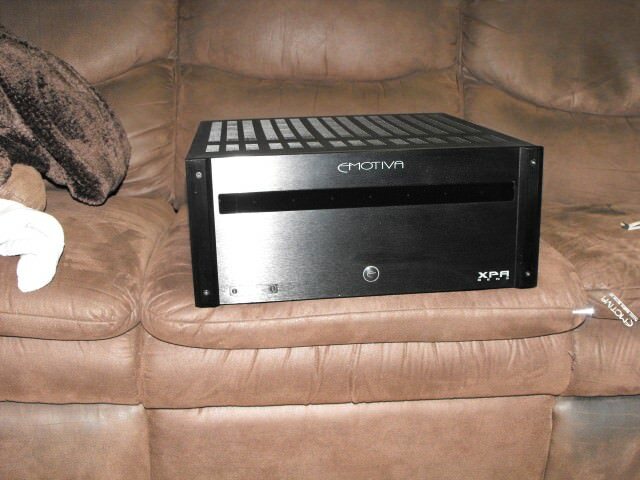 Next purchase will be an ADA-1500 Amplifier. I think I'm going to get kicked out of my apartment. too bad i never had a bad case of upgraditis! Anything that makes the M80s look that tiny...! Ugh. I did not want the 100s until I saw your picture. You sir, are evil. This is an edited version of a review that i left on another site. I took delivery of a pair of M100s on the day before yesterday. I spend all afternoon Friday all day yesterday and a couple of hours today (so far!) listening to them with classical, jazz, folk and rock. My previous speakers were the M80s. I find that the M100s have a demonstrably greater dynamic range. Even though the80 are very confident at high volumes, the 100s display an even greater confidence. I'm currently listening to Clapton's Layla - a rock record that is not just bunched up in a 10 decibel range. The 100s are throwing music at me in such a way that I cannot hear the separate speakers, rather, I can hear the music nicely separated into different instruments across the soundstage. I think that positioning is important with these speakers. Mine are not in their final position by a long shot. My wife and I started that conversation this morning and our negotiation is going to take some time. In any event, my questions about the 100s are as follows. First, I'm used to the Axiom sound, these do sound like Axioms - is that too much for me - do I need a complete change - I don't think so. I had my KEFs for ten years, I'm a long term lover so if I keep these big guys they will be here for a long time. Second, am I drinking my own cool-aid when I say that these speakers are great - I don't know. I keep wondering what the Bryston Model Ts sound like. The stupidity in these things comes to light when you look up reviews of the Bryston. Talk about over the top glowng reviews from all of the high-end mags and dealers. Turn the page and find peope who have not heard Axioms criticizing them to the nth degree. Not sure how to explain the implied statement that Axiom made an excellent overachiever for Bryston and a dog for themselves. Third, I've played lots of women's voices over the past 24 hours. I cannot detect any of the sibilance that some complain of in Axiom's. Both the "s" and "t" are pronounced with precision (except on a Joan Baez live album on which the sibilance is present regardless of the player and speaker). Mind you, I have to say that there was none of that sibilance or over brightness with the 80s either. Parts of Chopin's piano concertos bring me close to tears. I can actually feel the emotion welling up in me. These speakers do not disappoint on this matter, the emotional grab of the old romantic is very much there. Violins high (as they should be) and totally in control. On that subject, there seems to be little dynamic compression in these speakers physiognomy. They seem to be relatively free of artifact. Listening to the Moody Blues "Every Good Boy Deserves Favour". I've listened to these Moody Blues albums on everything from a clock radio to the highest end speakers - I know every note. Fantastic lower-mids drawing me right in. The speakers jump from high to low with great agility nothing seems to be compromised. As you can tell, I'm not into the numbers when it comes to music. I just love music (39,000 tracks on my Sonos, hundreds of vinyl albums and still have my CDs). 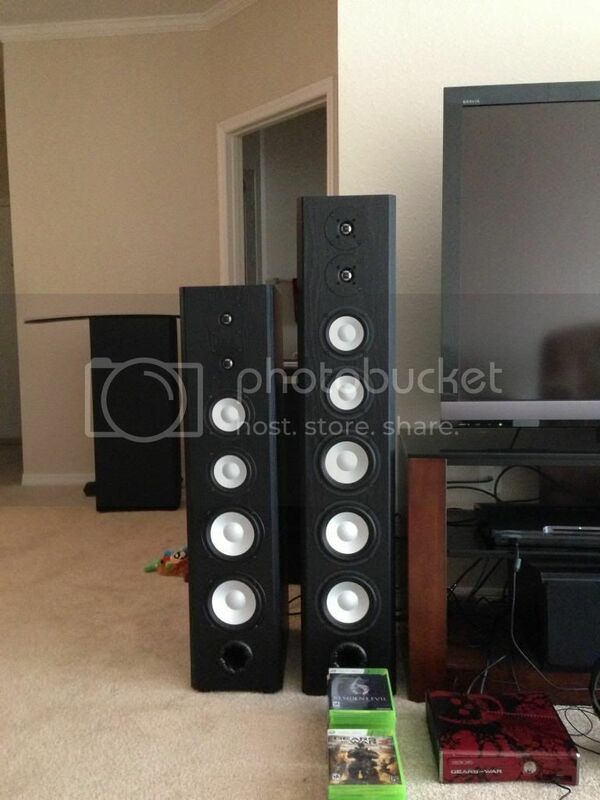 Someone would have to explain to me what the problems are with these speakers. I'll let you know more in the coming weeks. There is a relatively new artist named Ana Egge. My wife likes her, my daughter hates her. Anyway, with the M80s, the bass was fairly present but not what I would call driving. At the same volume with the 100s, the bass was almost scary it was so pronounced. All in all, I think that that the recording was put through a huge amount of dynamic compression (a fairly new concept for me) in order to achieve the result. For reasons that I cannot divine, that compression was not as noticeable on the 80 as it is on the 100s. I have heard the album elsewhere on good quality speakers - the 100s sounded more like those speakers. I'm thinking that the compression was deliberate in the recording and that is evident on the 100s. In listening to Handel's Coronation Anthems I found that there was far more "music" than with the 80s. Now what I mean by that is that the 100s gave up a more spirited musicality in the recording right across the dynamic range. In relation to the highs to the left of the soundstage, the 100s put me up next to the violins and they were incredibly clear. In relation to the choir I noticed something interesting. In listening to concerts in churches, I am always aware of how this building or that building sounds. It seems to me that human voices are more susceptible to changes in buildings than some if the instruments. That was so with the Handel - I could hear the effects of the building in a slight muting or dulling down of the choir's voices. So how do I know that muting was not the speakers - well, it was not apparent in the Purcell choral work that I subsequently played - nothing there, that recording, I believe, was made in a studio rather than a church. In relation to the bass on the Handel, it was incredibly realistic. I could not only hear it, I could feel it too - but then, I have felt the bass in concert halls. It seemed to me that the notes because they were bass notes were very precise no undue lingering. For a few years now, I have been thinking about bass notes in speakers and recordings as a sign of quality. It far more recently that I read in several places that the hardest thing to get right in speakers is the bass. To my ears, these speakers have it right. Even a loud volumes (the terrifying opening track on the Ana Egge album) the bass was clearly under control, it got louder not less clear. I'm a longtime Moody Blues fan. Today I played Every Good Child Deserves Favor and A Question of balance. When I was a kid, a few friends of mine and I would sit in the basement of one of our number and listen to the Moody Blues all night. We believed that we could pick out new instruments just about every time we hear the albums. Today's listening was like that - not as though I was hearing the albums for the first time but hearing parts of the instrumentation that I had long forgotten. I think that the Axiom people did some fiddling when they produced this new crossover because, with what I think is the same tweeter and the same midrange, they have produced a slightly increased vivacity - and that's really distinct from brightness, it's more a quickness in the top end - very much apparent in the Moody Blues recordings. The Moody Blues pretty much always used to start their albums off with some etherial sound coming out of space and rising to a crescendo. At the beginning of their albums, see how early you can hear those notes. On the 80s it was early on the 100s it was early and clearer. One artist who I thought would be challenging for the 100s is Joan Baez, she sings in a very high voice that can sound naturally sibilant sometimes. With the studio recordings that I played - no sign of trouble however, the live recordings did contain a little sibilance - not so annoying that I wanted to turn it off but it was there. As I said earlier, that sibilance is there in that recording anyway. Its has been there in my car, on my old KEFs , on the M80s and on my old PSBs. Yet another test was an Ella and Louis album - great test because you have Ella singing high and Louis singing low - both (I think) within the midrange. This album almost had me in tears it as so gorgeous. (I just remembered what I said to my wife about the Handel last night - it sounded lush - that was the sense - lush). Tonight I am going to listen to Cecelia Bartoli- now, she's challenging. When she sings castrati and in high coloratura, speakers have got to be in total control - the wrong tweeters could set your ears bleeding and I mean it! The 80s loved Bartoli - let's see what the 100s do. Ahh! Bartoli's album Sacraficium just divine, divine! If you have not done so, you should download a copy of the Sheffield Drum Test and or the longer Sheffield Test Disk - both on iTunes. Although the music is dated, it puts speakers through their paces in terms of the placement of instruments, the clarity of notes and the dynamic range of music that is moving around the scale with alarming speed. I listened to both of these albums on the 80 and w amazed at how those speakers handled the drumming - largely because of reworked lows on the 100s, I'm even more positively effected by the sound of these records, snare drums sounded incredibly authoritative, brushes sounded as though they were in the room and bass drumming sounded really urgent and close by. Not amazingly different to the 80s at the high level but startlingly different on the lows. The blended result was very well balanced. I have a pair of original Rogers LS3/5As in my breakfast room. They are connected to the whole 2-channel system. I've been going back there and listening to the Rogers then back to the living room to listen to the 100s. It really is like comparing apples to oranges in some respects but in other respects not. The Rogers are proven performers. Is the quality displayed by the Rogers similarly displayed by the 100s, is the clarity there, within the dynamic ranges of both speakers can I tell that the music is being handled well - any mud in either speaker and over brightness setting my teeth on edge. An I listening to high quality music in both rooms? Which speaker is more enjoyable within the range of their separate purposes? I have to say that they both sets of speakers pass my rough and ready tests with flying colours. So the Bartoli album contains music by Steffani and its called Mission. You really have to be into high coloratura mezzo-soprano in order to like it. This is the sort of music that really turns off most of the population. On the other hand, I'm telling you, if there is any falsity in the treble or the upper mid-range, this music is for absolutely sure going to show it - none! How about a Nora Jones track, Come Away With Me. I can tell that the high hat is being hit with a cotton covered drumstick or whatever they are covered with. The imagery is so strong, so real. I cannot remember how the same notes sounded on the 80s but this is so real. Most of us have listened to Enio Morrocone's music for The Mission. It's got everything in it. Full orchestral music, guitars, you name it. On the track Gabriel's Oboe, you can tell the difference between the 80 and the 100. On the 80 the bass is credible - on the 100 it is fantastic - it feels as though its pulling you though the floor! On the track "Refusal", the continued urgency of the lower notes combined with the high notes gives rise to an even greater emotional pull than when I heard it on the 80 s. Those drums are menacing! Further up the album on the track Carlotta, I think it is, you can sense what a horror this music would be on cheap speakers. I've heard it on crappy and medium priced stuff, those women's voices approach a squeak and only well rendered speakers can keep them under control to the point that they are articulate very, very alluring. The 100 seem to walk through the track without effort. Bottom line. These are new speakers. Holy c**! Dire Straits "Brothers in Arms" a la M100!! Most excellent review. I thought I loved music but compared to you, it would seem that I just like it a bit . For anyone interested, the rogers speakers are highly regarded powered monitors used by the BBC and the asking price of a used set is upwards of 3 grand . Patcase, what a review, and some of the same tastes in music as mine too. i listen to music only a couple of hours a day, and after about 2 years, i'm still enjoying my Axiom system as much as when i originally finished calibrating everything. I've got a funny story about the Rogers. Thirty three years ago, when my wife and I moved in together, she brought the Rogers to our union. She bought a pair of huge box speakers too. Thinking that big was always better, I set up the big boxes and stored the Rogers. A couple of years later, we had a huge party (the sort that we used to have back then with university friends and others). I put the Rogers in the garden and ran a couple of lamp wires out to them. A couple of days later, a friend came over and saw the Rogers in the yard. We brought them into the house and set them up. Wasn't more than ten minutes before I learned that I'd been listening to the wrong speakers. I've listened to speakers very carefully since that day. Couple of thousand dollars worth of speakers out in the garden for two days! As you can see, I don't change my stuff too often. The one year M80 ownership is unprecedentedly short for me.